Tears of thankfulness flowed freely as eleven heavy road transport trucks loaded with much needed fodder for animals arrived at different farmers unions to be distributed to those farmers who simply cannot continue to keep their animals alive any longer. Still, in the hour of their most desperate need, some farmers in southern Namibia allowed others to benefit from the godsend before them simply because of the good rains that fell last weekend. The rain brought hope of new life on their farms for a desperate farming community. Werner Kruger, operations manager at Kaap Agri in Namibia, said the company approached bigger businesses in Namibia to see if a helping hand could not be held out to people who faces ruin because of the drought. 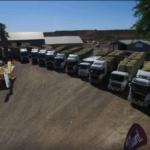 Kruger said most of the fodder was acquired from the Hardap Irrigation Scheme but the logistic involved required the assistance of several people with the ability to transport the bulky bales of fodder. A\ccording to Kruger they were able to buy roughly 5 000 bales of fodder of different kinds at a cost of almost half a million dollars. It took eleven heavy road transport trucks to transport the animal feed to the distribution points. Another person involved with private initiative who witnessed the convoy of trucks as they left the premises where the fodder was gathered before distribution on Thursday said tears of thankfulness flowed freely even more so when the trucks arrived at the farmers unions. Kruger said he has already started with the process to help more desperate farmers. The Namibia Agricultural Union along with the Namibia Emerging Commercial Farmers Union met with the Minister of Agriculture, Water and Forestry in the first week of February to discuss possible assistance for farmers. According to NAU Executive Manager, Roelie Venter, the agriculture minister received the joint action plan with various possible solutions to assist farmers decimated by the severe drought in good spirit. According to a statement by the NAU at the beginning of February, the severity and impact of the drought will be far worse than previously expected because no significant rain has fallen in the country and very little feed is left locally to keep farm animals alive.